Spending money with any form of attribution is what I like to call “flying blind”. Flying blind isn’t necessarily a waste of money, but it creates a great number of inefficiencies. Inefficient spend happens to all accounts, but at least tracking allows an opportunity to identify and correct those inefficiencies. Of course, over-attributing a marketing source is giving too much credit, which only encourages greater inefficiencies in the future. This concept should be rote to the average marketer, but frequently, the AdWords Conversion Tracking pixel is relied on too heavily for tracking. The AdWords Conversion Tracking pixel has been the friend of many of Pay-per-Click specialist for years. It works very simple; the advertiser adds it to the Thank You/Confirmation page. When it fires, it looks at the browser cookie. It then checks to see that the user’s browser has the prerequisite cookie indicating that the user had clicked on an AdWords ad from the same account in the past 30 days. If the pixel and cookie match in the required time period, the pixel sends the data back to your AdWords account with the keyword, campaign, and ad data. The AdWords account then adds proper attribution to the appropriate campaign, keyword, and ad. While I have no complaint against the AdWords Conversion Tracking pixel, Google AdWords (and Bing Ads too) have a responsibility to their advertisers to show when a click they paid for lead to a sale, lead, or action. However, this leads to PPC getting way too much credit in some cases and not enough credit in others. Imagine that your client’s buying cycle is at least 60 days. The AdWords pixel won’t track that by default. While advertisers are able to extend this time frame up to a maximum of 90 days, the Google Analytics pixel is active up to 540 days. The other problem is simply that AdWords (and Bing) take all of the credit. Google Analytics is focused on being mostly agnostic towards traffic. The default Google Analytics attribution model is the Last Non-Direct Click Attribution Model. This model tries to give credit to the last traffic source that wasn’t a direct click. Having both attribution methods provides much better data analysis. Lastly, AdWords can’t track anything based on an event or conditional metric like the number of pageviews, which Google Analytics is perfect for. So, there are actions that Google AdWords would not be able to track by itself. 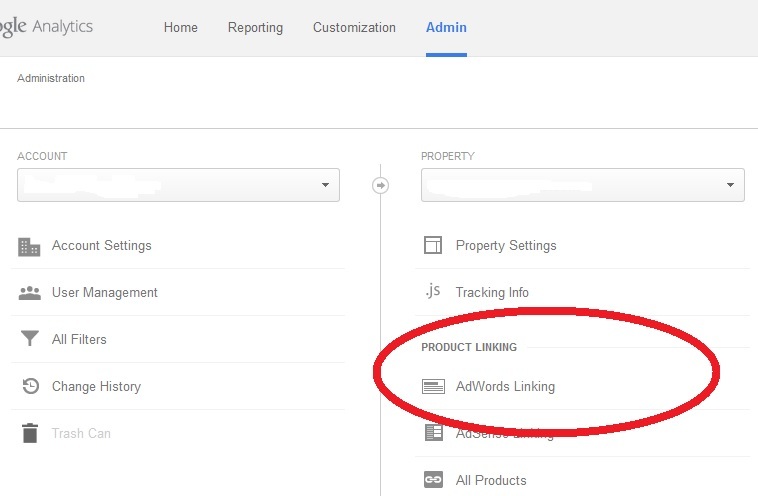 The first step required is to connect Analytics to AdWords by navigating to the Admin tab go to the AdWords Linking link under the Property column. The following page should show a large, red “New Link Group” button. Click the button and follow through the series of ensuing steps. Just make certain to choose the correct AdWords account! After the Google Analytics is attached to the AdWords account, the next step is to import the desired Analytics goals as conversions. The first step in doing so is to visit Tools -> Conversions. 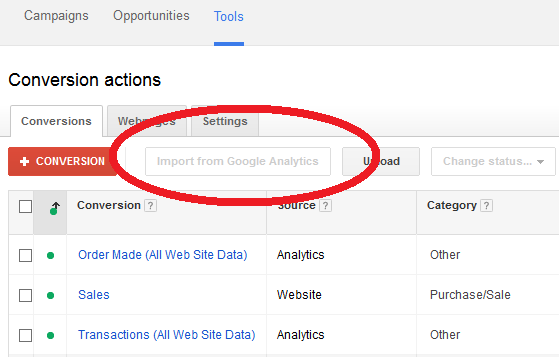 Upon reaching this page, if there are available goals to import from Analytics, the Import from Google Analytics option will not be greyed out as it is in the screenshot below. Note that Analytics conversions will be listed with the name of the goal followed in parenthesis by the name of the View that it originated from. It is important to understand how AdWords handles this data. First, AdWords will dedup conversions, which removes the danger that redundancy can provide. Also, goals may take 48-72 hours to arrive. 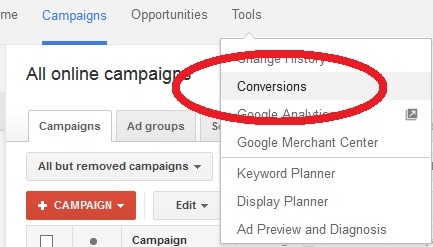 This can make the most recent reporting from an AdWords account look poor if a great deal of the conversion data is coming from Google Analytics. Also, while advertisers may also choose to remove these conversion imports and/or re-import them at any time, they are not shown retroactive to the time the Analytics metric was added. You will likely see discrepancies between the two sources. In Analytics, the day the conversion happened is what will be reported. In AdWords, the day the click occurred will be reported, even if the conversion happens much later. Lastly, Click-to-Call conversions from an AdWords Call Extension will never hit the website, and thus, they will not be reported in Analytics. It is still best to study the data in Analytics regularly. But having the extra conversion metrics in AdWords allows easier account optimization towards goals. In a future blog post, I will show how to link a Google Analytics view in a way that enables Analytics stats such as bounce rate and pageviews to be shown.